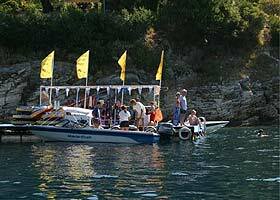 Welcome to our Corfuboats website and the wonderful world of boating and water-sports on the island of Corfu. This popular holiday destination has always been known for its beautiful beaches and their crystal clear waters. Imagine exploring the endless coves and bays of the sheltered North East coast at your own pace and finding your own secluded bathing spot. Visit some of the many seaside tavernas, gift shops or markets by boat, stopping off for a swim or a snorkel on the way. For private boat owners more adventurous journeys to the stunning islands of Paxos and Anti-Paxos south of Corfu and the Islands of Erikousa, Othoni and Mathraki off the north-west coast of Corfu, can be made. On the mainland of Greece a day trip to Parga, Mourtos, Syvota or Sayiadha (famous for its wonderful prawns) is also possible. Travel by boat has certainly proven a much more relaxing and desirable option to the many visitors who return to Corfu each year. For the many private boat owners who choose to keep their boats on the island, North East Boat Storage and Services (NEBBS) offer a complete management service for owners to ensure the maximum use of their holiday time for hassle free boating. For those of you who don’t have your own boat, we can recommend Kalami Boats, well-presented, properly equipped, licensed boats for hire. 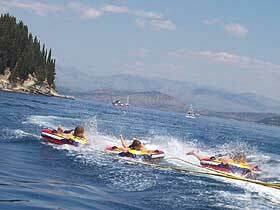 For the energetic, water-skiing could never be a more pleasurable experience than on the warm Ionian sea and under the professional and safe guidance of Sakis Water Sports. 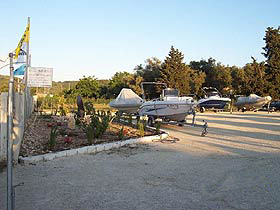 NEBBS and Sakis Water Sports are owned and managed by Harris and Louise Katsaros. Harris was born and brought up in the Kalami area of Corfu, and Louise, originally from Dumfries in Scotland came to and settled in Corfu in 1990.  In 1993 Louise was given the opportunity to take over Sakis Water Sports, which had successfully been teaching water-skiing in Kalami since 1986 and with whom she had worked for the previous three years. Harris joined forces with Louise in 1994 and in 1996, together, they opened a second business in Kalami, Harris Kalami Boats, a self-drive day-boat rental company. 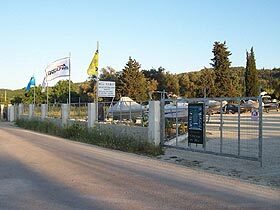 In February 2004 they opened a third business, North East Boat Storage and Services, which provides boat storage and several auxiliary services to the many private boat owners in Corfu. In 2007 due to the great success of this business, greater demands on time and human resources, and a wish to remain hands-on, the decision was made to sell Harris Kalami Boats. Stavros Sarakinos also from Corfu and manager of the Adonis Asonitis Hotel complex in Kalami, now operates the boat hire under the name of “Kalami Boats”. Both Harris and Louise have over eighteen years of experience in the boating business. Apart from the experience they have gained through managing their own businesses, they are both fully qualified power-boat handlers to RYA level three standard and Harris to day skipper level. 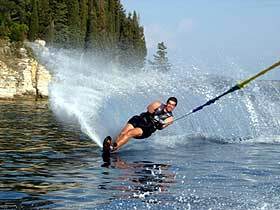 They are also both fully qualified British Water-ski Federation Instructors. Their love of the sea has encouraged them to take as many courses and qualifications as spare time will allow. To this end, so far, Harris has successfully taken part in powerboat racing and has also become a qualified lifeguard and deep-sea diver. Their years of involvement in the boating business has also put them in touch with many seafaring experts. What they can’t do themselves, as the saying goes, They know a man (or woman) that can!